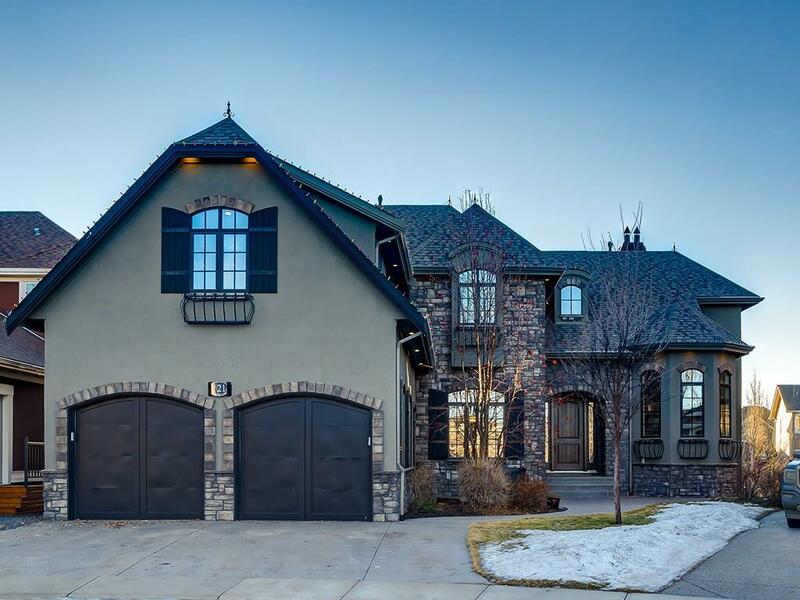 DESCRIPTION This jaw-dropping luxury 5 bed/3.5 bath home with quad attached garage is nestled in Airdrie's best community and will not last long! Over 5000 sq.ft of living space with plenty of natural sunlight from the SW exposure. Your cooking dreams come to life in the authentic chef’s kitchen with all top of the line stainless steel appliances, large island and butlers pantry with lots of storage. Extensive millwork has been done throughout the home including the maple octagon ceiling in the library, as well as wainscotting panels and coffered ceiling in the formal dining room. Unwind in the huge master bedroom fit for royalty that features a 5pc ensuite, gas fireplace, and walk-in closet. A fully-finished walkout basement includes a rec room, additional bedroom, private theatre room, games room, and your own wet bar. Outside, you’ll find a SW backyard with two decks and a spacious exposed concrete patio area. Every element, every detail in this home is finely tuned for your enjoyment and is perfect for entertaining friends and family. With lots of cozy spaces to share and plenty of private rooms to enjoy a good book in. Hurry before this chateau is gone! Home for sale at 121 Coopers Pa Sw Airdrie, Alberts T4B 3L7. Description: The home at 121 Coopers Pa Sw Airdrie, Alberta T4B 3L7 with the MLS® Number C4221590 is currently listed at $1,195,000.